The wastewater treatment facility of the Clear Lake Sanitary District is a complex combination of static, mechanical, and electrical equipment working together to treat wastewater from the Sanitary District. Wastewater contains many different types of microorganisms. These organisms enter the sewage system with human wastes and surface runoff. Many of these organisms are harmless and serve as the "workhorses" in biological processes by converting the soluble organic material in the wastewater into new cells and inorganic elements. Raw sewage enters Clear Lake Sanitary District's collection system from households and other establishments and flows to the wastewater treatment plant. Depending on seasonal conditions, infiltration from the groundwater and entrance of surface water into the wastewater collection system also contributes to the volume of flow received at the plant. Wastewater is 99.9% pure water. The remaining 0.1% consists of dissolved and undissolved materials. Wastewater can be characterized in two major classifications: by origin and by enumeration of physical, chemical and biological characteristics. Starting from over 5000 homes and business around the Clear Lake Sanitary District, 11 pump stations and approximately 60 miles of pipe gather the sewage and carry it to our state of the art sewage treatment plant. In simplified terms, both physical and chemical processes are utilized to remove solid matter from wastewater, while living organisms consume organic materials and turn them into harmless components. Fresh domestic wastewater has a somewhat disagreeable musty odor while a rotten egg odor may result from anaerobic bacteria in the wastewater feeding on organic material, thus producing hydrogen sulfide gas (H2S). This gas is very corrosive and can cause damage to equipment and systems. 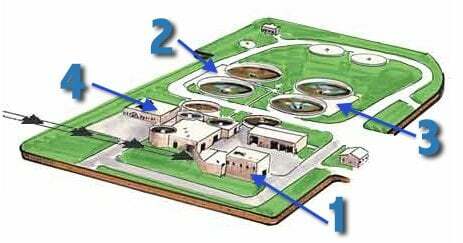 If the collection system transports the wastewater rapidly to the treatment facility, the odor will be maintained. Conversely, if sewer lines are allowed to become blocked with debris, thus impeding the flow, the wastewater may become septic and very odorous. Hydrogen Peroxide (H2O2) is then added if necessary which destroys the Hydrogen Sulfide. The typical steps in wastewater treatment include preliminary treatment, secondary treatment (activated sludge), effluent disposal, and sludge handling and disposal. Preliminary treatment is the conditioning of the wastewater and removal, or neutralization of any substance that may be harmful to the system or affect its operation. Such materials includes lumber, cardboard, rags, plastic, grit, grease and scum. Initial screening takes place at the pump station while the Bar Screen removes debris at the treatment plant. Two 55 inch diameter, basket type fine screens with _ inch bar spacing are positioned at a 35 degree angle as wastewater flows through larger particles are blocked and removed by a rake arm. Some of the more common items are plastic bags, rags, and paper, however some items are more entertaining such as money, toys, and jewelry. Wastewater flowing from the fine screen process proceeds by gravity to the grit removal process. Grit is composed of inorganic material such as sand, gravel, and metal shaving and non-degradable organic material like coffee grounds, eggshells, and hard-shelled seeds. This material can cause abnormal wear to mechanical equipment and pumps and also clog pipes. The grit along with bar screenings is then taken to the North Iowa Landfill to be disposed of properly. The secondary treatment process of wastewater used is a Sequencing Batch Reactor (SBR) which is a form of Activated Sludge and includes the following steps: Fill, React, Settle, Decant/Idle, and Sludge Waste. This system consists of four (4) circular basins each having a minimum capacity of 535,000 gallons and a maximum volume of 0.950 million gallons. Microorganisms, mostly aerobic bacteria are used to digest the organic wastes. By creating an environment in which these microbes can thrive, the process is done much more quickly. Wastewater flows from the grit removal system and is thoroughly mixed for equalization and to promote an anoxic environment to allow for sludge conditioning and the growth of phosphorus removing bacteria. The SBR continues to fill while blowers provide aeration and mixing continues to enhance oxygenation. Aerobic bacteria already present in the basin begin the digestion process and organic matter is depleted. The wastewater flow is halted while mixing and aeration continues and the processes are enhanced. 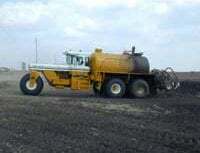 A proper environment must be maintained for the aerobic digestion process to thrive. Temperature, pH (or sufficient Alkalinity) and time are major considerations for bacteria to feed, grow, and reproduce. Over a 6-8 hour period the bacteria eat most of the dissolved organic material in the wastewater. During this time period, the sludge solids settle to the bottom of the tank, leaving a clear layer of water or treated effluent. Mixers and blowers are turned off, creating a calm, still environment to allow for solids separation and settlement to the bottom of the basin. This phase allows for the removal of the treated effluent, which has clarity of over 6 feet, to be routed to the Tertiary Treatment system. Sludge refers to settled solids accumulated and subsequently separated from the liquid stream during various phases of wastewater treatment. As the microorganisms multiply to excess during the treatment process, they must be removed or controlled from the system for proper operation. Waste activated sludge is aerobically digested, stored, and applied as a fertilizer and soil conditioner in land reclamation and agricultural applications. The Tertiary Treatment system is a required treatment process in order to meet reuse water quality parameters. The targeted parameters are Total Suspended Solids (TSS), Biochemical Oxygen Demand (BOD), and Total Coliform bacteria. Filters are utilized to reduce the TSS and BOD concentrations in the treated effluent. Secondary effluent is passed through a cloth media that filters organic residue that contributes to TSS and BOD. The filtered effluent is then routed through the Ultraviolet (UV) disinfection system. The ultraviolet light that is emitted kills most bacteria including the targeted Total Coliform bacteria. The tertiary effluent is then ready for reuse by Interstate Power and Light's electric generation facility as cooling water. Nearly 80% of the cooling water is evaporated. That portion which is not evaporated is pumped back to the Clear Lake Sanitary District for direct discharge or treatment. In-line chemical analyzers measure chlorine among other constituents in the pipe bringing cooling water back to the sanitary district. Any detectable chlorine will initiate a sodium bisulfite chemical feed pump. Sodium bisulfite is a liquid solution that eliminates detectable chlorine prior to discharge. Pump stations are located at various spots around the lake. Waste is collected at the pump stations and them pumped the rest of the way to the facility for processing. 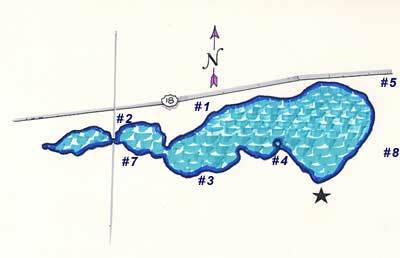 The following map shows the location of the eight pump stations that surround Clear Lake.